The Pixel and Pixel XL are Android smartphones designed, developed and marketed by Google. They were announced during a press event on October 4, 2016, and serve as the first smartphones in the Google Pixel hardware line, succeeding the Nexus line of smartphones. On October 4, 2017, they were succeeded by the second-generation Pixel 2 and Pixel 2 XL. The Pixels have an aluminium chassis, with a glass panel on the rear, a USB-C connector, 3.5 mm headphone jack, and a 12.3 megapixel rear-facing camera. At launch, the devices featured certain exclusive software features, including the 7.1 "Nougat" update to the Android operating system, integration with the Google Assistant intelligent personal assistant, live technical support services, and unlimited full-resolution Google Photos backup for the life of the device. The Pixels received mixed reviews. They were called "the best Android phones you can buy" and received praise for camera quality and performance. However, they were criticised for their high prices and lack of waterproofing, and some critics noted design similarities to Apple's iPhone. The Pixels have suffered from a variety of issues after release, including excessive optical lens flare in pictures captured through the rear camera, connectivity issues with some mobile data bands, unstable Bluetooth connections, unexpected battery shutdowns, and failing microphones. Google has acknowledged and released fixes for most of the issues. The Pixel 2 and Pixel 2 XL are Android smartphones designed and developed by HTC and LG and marketed by Google. They were announced during a Google event on October 4, 2017, as the successors to the Pixel and Pixel XL. They were released on October 19, 2017, and serve as the second set of smartphones in the Google Pixel hardware line. The phones ship with stock Android 8.0 "Oreo" on launch. Google has promised three years of software and security updates, making it closer to the average four years of support that Apple provides for its iPhones. The new Pixels also include a feature called "Active Edge". With this, the Google Assistant can be launched by squeezing the phone's sides, similar to the HTC U11's "Edge Sense" feature. This phone was also released with the new Google Lens app, which is designed to bring up relevant information using visual analysis by the camera. Pixel 2 and Pixel 2 XL also automatically reverse searches songs which are playing around the device. Android 8.1 Oreo was released for the Pixel 2 and Pixel 2 XL on December 5, 2017. Pixel 2 owners receive free unlimited storage for all photos and videos taken on the phone in original quality through the end of 2020, with unlimited high-quality storage continuing afterwards. The Pixel 3 and Pixel 3 XL are Android smartphones from the Google Pixel product line. 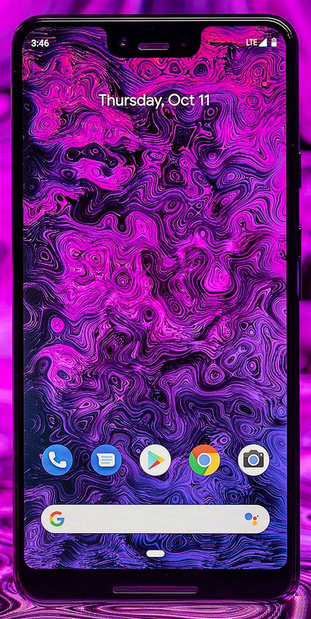 The Pixel 3 and Pixel 3 XL come with a Snapdragon 845 and 4 GB of RAM; and 64 or 128 GB of internal storage. Both phones feature glass backs and wireless charging, which are firsts for the Pixel range. Google Pixel Stand can wirelessly charge at 10W, but wireless charging is capped to 5W when 3rd party wireless chargers are used. They also feature front-facing stereo speakers and no headphone jack, like the Pixel 2 and Pixel 2 XL. Both phones also use a USB-C connection for charging and connecting other accessories. Both phones also contain Active Edge, where squeezing the sides of the phone activates Google Assistant, which debuted with the Pixel 2 and Pixel 2 XL. The phones have a water protection rating of IP68 under IEC standard 60529, an improvement from its predecessors water protection rating of IP67.